Nellie was born in West Danville, VT in 1917 and grew up on Walden Mountain. She married Bernard Badger, who was the foreman for the U.S. Bobbin Shuttle Company's logging operations but she claims it was the experience of growing up in the wilds of Walden Mountain, without electricity, without indoor plumbing and without central heating that enabled her to enjoy her life as cook in a logging camp. At an early age she had learned to love the woods and found she would rather go hunting, fishing and trapping than wash the dishes for her eleven brothers and sisters. After working in the logging camp at both Lowell and Victory, Vermont, the U.S. Bobbin Shuttle Company moved Nellie and her husband to Long Lake, New York to continue their logging operations. Since that time Nellie was actively involved in fish and wildlife management, in fish and game clubs, as a trapper/ hunter safety instructor and as President of the Adirondack Conservation Council. 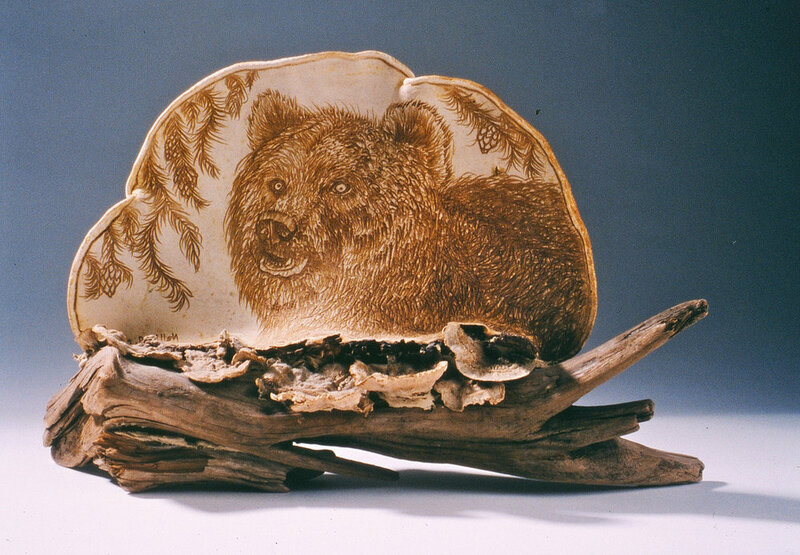 In addition to being an avid outdoors woman and staunch conservationist, Nellie was also know for her art—engravings she made on tree fungus. With the point of a drawing compass Nellie would etch images of wildlife and the natural world into the canvas-like bracket fungi. The fungus released a brown-tinted ink that provided the coloring for Staves’ drawing. It is an art form that dates back to the mid-19th century. Nellie passed away in 2009. Nellie describes cooking and life at a logging camp.